I looooooooove Target - definitely my favorite store to shop at. 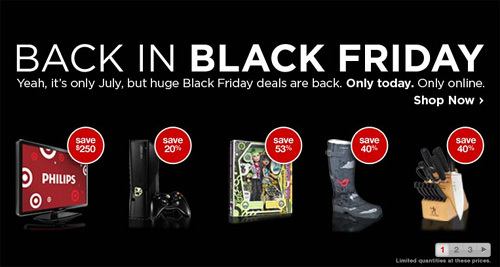 Today that are having an online only Back in Black Friday Sale at Target.com. Everything from electronics to toys to home goods are on sale! Like a Kodak EasyShare M52 14MP Digital Cameraa regularly $149.99 is now only $89.99! Or a Britax Roundabout Classic Carseat for only $100! There are so many great deals but quantities are limited so hurry on over and check it out!